Quality Kitchen Knives: How Many Do You Really Need? As any professional chef will tell you, buying a set of quality kitchen knives is one of the most impactful things you can do in terms of improving your cooking performance—well, that and practice. Sharper, higher-quality knives mean you can make more precise cuts. Not only does this make chopping things easier, but it can affect how foods cook! But is one knife enough? Can you make do with two? Generally speaking, it’s better to invest in a few great knives rather than a dozen poor-quality knives. But where’s the balance between the two? We’ve discussed this before, but understanding why a certain level of quality is important will help you find the best kitchen knives for your needs. We could describe the important knife qualities for hours on end, but if you don’t know what those qualities will do, it’s not going to help you. So, here’s the most important thing: a better quality knife will help you cut better. Sure, it sounds simple, but in the end, that’s the most important part. When it comes to cooking, your knife skills can actually affect how well or poorly something cooks, and a better-quality knife will help your knife skills more than you think. One of the key lessons for having good knife skills is to remember the importance of size. Whether you are slicing, dicing, or cutting everything to a tiny brunoise, chopping a food to entirely the same sized pieces is vital if you want it to all cook evenly. For example, when you’re chopping up carrots for chicken noodle soup, it can be obnoxious to have chunks of carrot that are practically mush while others are still rock hard. Instead, if you take the time to chop each carrot down to same-sized pieces, they will cook evenly without extra help or modified timing and all come out the same texture in the end. Or, if you’re cooking chicken breasts for the family, a one-pound breast will take twice as long to cook as a half-pound one. Instead of starting one chicken breast so much sooner than the other (or, heaven forbid, horribly undercooking or overcooking one), slice the larger piece into two even pieces; that way, all three will cook at the same rate and be ready at the same time. A better quality knife will hold a sharp edge better, which, in turn, makes it easier to be more precise with your cuts. The other key reason for a better quality knife is that of safety. We know, it doesn’t sound logical, but a sharper knife is inherently safer than a dull one. When you’re chopping with a dull knife, you’ll need to exert more force to actually get things to cut. If a finger happens to get in the way of the knife’s path, that dull blade will come down with more force and cause a deeper injury. When a knife is well-sharpened, you don’t need to exert nearly as much force for the same result, so the knife is less likely to slip and cut you in the first place, but if it does, any cuts will be clean and less deep, so they’ll heal better. 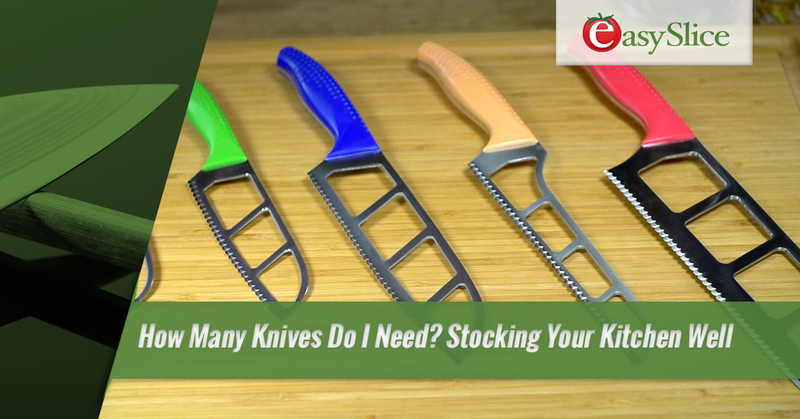 So, How Many Knives is Too Many? Too Few? Really, there’s probably no such thing as having too many knives. If you have the budget to buy every specialized knife type out there, go for it! For those of us without an unlimited budget, however, the question of knives can often be one of necessity and utility. As we mentioned above, one great knife is going to generally be better than having several lesser quality knives. But if you have the budget for a few knives, what’s the magic number? Well, sadly, there really isn’t one. It will depend on your needs and what you make most frequently. If you can only get one great knife, start with a high-quality chef’s knife. But if you’re vegetarian or vegan, you won’t exactly have need for a carving knife. Instead, a serrated edge knife would probably be more useful as a second knife. The point at which you have too few knives is when you find yourself constantly wishing for a knife better equipped to handle a task you do often, or if you find that accidents are happening with an increasing frequency. When it comes to stocking up on quality kitchen knives, the biggest factor is you and your use. However, when speaking in broad terms, some knife styles are more generally useful than others. Many professional cooks will suggest that, if you only get one knife, you invest in a great quality chef’s knife. This is what you’ll most often see them using on those TV cooking shows; it’s usually 9 or 10 inches long with a decent curve to the blade. It’s a knife made primarily for chopping, but good for most culinary uses in a pinch. From there, other knives on the more-widely-useful end of the spectrum include a good paring knife and a serrated edge knife for slicing. Once you have those, add on more specialty-use knives according to your needs and budget. While most knives are designed with only one use in mind, Easy Slice has gone the alternate route. 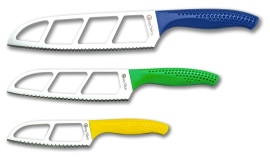 Our goal was to create a utility kitchen knife that suits any use, from neatly slicing a soft cheese to carving up a pumpkin. Our knives are all made with a double-scallop edge, which helps our knives cut straight every time. In addition, every Easy Slice knife is made to a 57 on the Rockwell Hardness scale, which means you don’t have to worry about what to do when the knife goes dull, because it won’t! You can see our knives in action on our YouTube channel, or read up on all of the amazing features here. 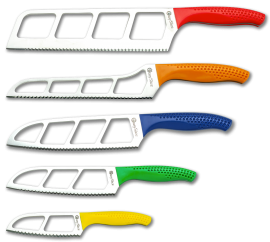 Are you ready to see just how easy an Easy Slice knife can make cooking? Shop our full selection of quality kitchen knives online today! What Makes Kitchen Knives Quality? What Should I Look For in Quality Kitchen Knives? How to Sharpen a Knife: Do I Need to?